The FIFA presidential election will take place on Friday in Zurich, giving the game’s power brokers a golden chance to affect change. But there’s a catch. The 207 eligible presidents of the national football federations wield the power to vote, yet these officials are, according to the U.S. Department of Justice, steeped in a world where brazen criminals have repeatedly milked the sport for their own personal profit. Jens Sejer Andersen, international director of the influential Danish sports organisation Play the Game, agrees. He told Bleacher Report that for years FIFA ran a quasi-protection racket for allegedly corrupt football federations around the world. 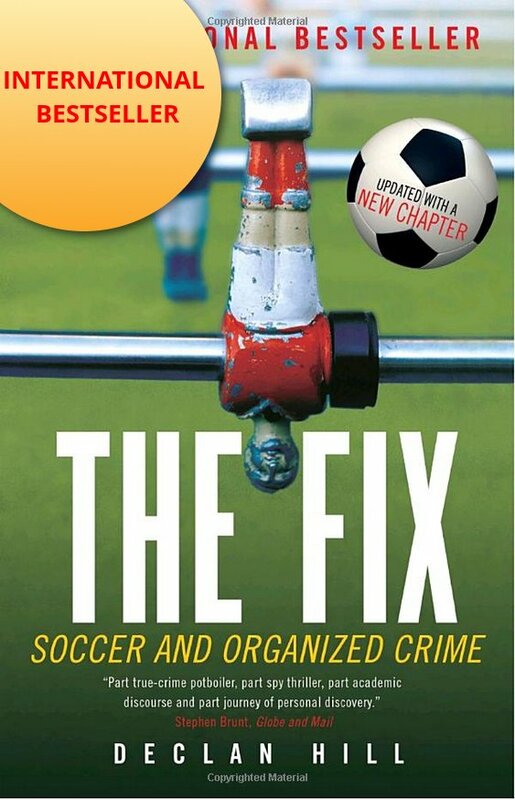 Andersen says that anytime police forces tried to investigate a national football federation, FIFA told their governments to stop, or it would ban their countries from international football. This is a threat few politicians outside the United States have dared take on. And so, with an election looming large, the question becomes this: How can we trust those trained by and molded by the departed corruptors to deliver a future that’s more honest than the FIFA they’ve known so far? The football pitch is beside a crumbling roundabout on the back lanes of the Cayman Islands, surrounded by palm trees. There are only a few things in the Cayman Islands that can be described as bustling. The pitch is not one of them. The day Bleacher Report visited, a solitary chicken pecked its way across the grass. No one is sure exactly how much money it took to build the pitch, but one fact is indisputable: FIFA sent the Cayman Islands Football Association (CIFA) over $2.2 million to fund facilities for a CIFA Center of Excellence. It does not seem like the Cayman Islanders got much for their money: There is no stadium, no stands, no lights—just a field with green, artificial turf, two sets of goalposts, team benches baking in the hot sun and a small office building. Five years and countless investigations later, the puzzle of where FIFA’s grants to the Cayman Islands went is the perfect symbol of the problems of governance across the football world. In the summer of 2015, the Cayman Islands Anti-Corruption Commission began an investigation after an independent audit of CIFA discovered suspicious transactions. They discovered that two donors had given the association $1 million. CIFA has not revealed who the donors were, and it does seem strange that the money was originally listed as “unsecured loans” before being re-classified as sponsorship payments. Worse followed in November, when Jeffrey Webb, the Cayman Islands man who helped control CIFA, pleaded guilty to running the Confederation of North, Central America and Caribbean Association Football (CONCACAF) as a multimillion-dollar racketeering venture. As part of his official plea bargain with U.S. authorities, Webb admitted to corruption in just about every aspect of his football business dealings and even misappropriating the funds intended for youth footballers in the Cayman Islands. Renard Moxam, who served as technical director for the Cayman Islands men’s national team from April 2014 until his removal from the post in November, remains baffled at how such funds might have been distributed in the name of football. “When we flew to Belize (for the team’s only away World Cup qualifying match in March 2015), I asked for $200 for each of the players to help them buy new boots or [for] general expenses for our international match,” Moxam told Bleacher Report. “The request was refused. In the summer of 2015, disconsolate at the state of Cayman Islands football, Moxam attempted to stand as a presidential candidate for the national football association. After initially accepting his bid, a few weeks later CIFA officials declared his candidacy invalid for technical reasons. Then they had an election with only one candidate—the incumbent vice-president Bruce Blake, who won and promptly declared that all was well at the association. The national government just as promptly cut off its funding to the organisation, and sports minister Osbourne Bodden publicly called for an independent inquiry into the multi-million dollar football pitch and centre of excellence, as per the Cayman Compass. It is all very embarrassing, since the Cayman Islands was where football was supposed to launch its cleanup operation. In 2011, when Jack Warner left his FIFA role as president of CONCACAF in a storm of controversy, his permanent replacement was none other than Webb. At first, Webb was full of promises. Everything was going to get better: New officials would lead the organisation to a corruption-free future; a code of ethics was instituted that specifically forbade bribes; and cliches about accountability bloomed like daisies in the summer sun. In the end, his words meant nothing. Dr. Laila Mintas was the former director of integrity for CONCACAF, based in the Cayman Islands. Her thankless task was to ensure the organization was run in an honest fashion. She did not succeed. The roll of CONCACAF dishonour is long: Three CONCACAF presidents and various officials, including one who was on FIFA’s Fair Play committee, have either pleaded guilty to fraud or been indicted by U.S authorities. It is not only senior executives at CONCACAF who have been arrested. U.S. authorities have indicted men who helped run CONCACAF and were presidents of the national football federations of Guatemala, Honduras, Costa Rica, Nicaragua, El Salvador (where almost the entire national team was banned for match-fixing) and Panama. CONCACAF’s problems spread beyond Central America. In 2011, officials from some of the Caribbean national football federations were caught on tape being offered $40,000 each by Warner to vote for FIFA presidential candidate Mohamed bin Hammam. Many of those associated with that event still hold office, and some will be going to Zurich to vote for the next FIFA president. CONCACAF is far from FIFA’s only problem area, and its fraud and corruption alone are far-reaching enough to undermine the credibility of the entire organisation. The U.S. Department of Justice, however, states that there are far more than a “few rule-breaking individuals” in international football. The sheer number of indictments is, according to attorney general Loretta Lynch in a press conference watched around the globe in June 2015, proof of a “rampant, systemic and deep-rooted” racket inside football. In FIFA’s case, it is pretty easy to pinpoint the exact moment its global empire began to collapse. 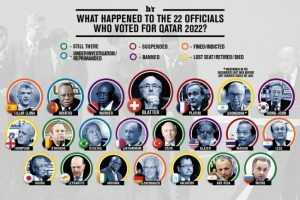 At 4:10 p.m. (Central European Time), on Dec. 2, 2010, Blatter stood in a Zurich conference hall in front of a television audience of over a billion people and pulled from a white envelope the name “Qatar” as the hosts of the 2022 World Cup. Blatter himself received an eight-year suspension from FIFA itself, purportedly for giving his chief rival—former UEFA president Michel Platini—a covert payment of $2 million in Swiss francs. On Wednesday, it was announced the ban was reduced to six years after an appeal. Beneath the ExCo, FIFA has six continental confederations. If you ignore all the allegations of official corruption, secret payoffs and organized match-fixing coming out of Asia, Africa and Europe and focus on just two confederations—CONMEBOL, the South American confederation, and CONCACAF—FIFA still has a serious problem. The U.S. authorities have indicted an extraordinary number of senior officials, including two presidents, two secretary-generals and a treasurer who ran Latin American football at CONMEBOL. Police also raided CONMEBOL headquarters in Paraguay. At the national football federation level, the 10 South American countries that make up CONMEBOL, senior officials have either been arrested or resigned because of this corruption scandal. Thomas Bach is president of the International Olympic Committee and no stranger to the corridors of sporting power. Jens Seger Andersen, the outside critic of the sport world, would prefer a revolution. Yet FIFA’s regulations effectively prevent an external candidate from running, as outlined in its own rules; it officially prevents anyone who is not a FIFA executive from running for the presidency. 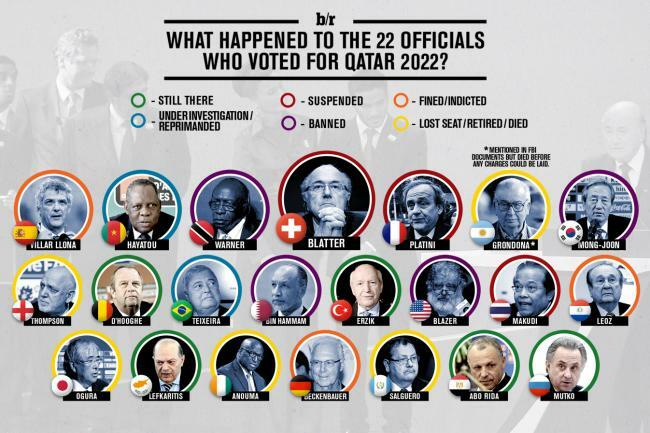 The only people who can vote are the 207 federation presidents, most of whom have also been inside FIFA for years. In short, the only person who can win the FIFA presidential election is an insider. Brilliant article as always, Declan, the structures of FIFA and its associated Confederations all need a complete overhaul and the complete structure changed! Nothing short of a revolution and complete overhaul has to take place! The current structure of FIFA is undemocratic, full of corruption and cronism, surely the global sponsors of FIFA would demand total and dramatic change! Nothing else but a complete dismantling of this pathetic and corrupt past and current regime, along with all its lackies and cronies is the only way forward! then, only to be told to shut up by some CSA brass! A few of us never, ever lost faith that one day the truth would be told and that FIFA and Concacaf would be exposed thanks to the likes of you Declan, Andrew Jennings and a few other very brave souls around the FIFA globe! Fifa’s current rules and regulations are indeed a complete and utter farce no doubt made for a FIFA and Concacaf insiders to carry on with the same corruption! About the best that can be said, is that Kofi Annan won’t be called in by a Prince to “reform” FIDE of its corruption. 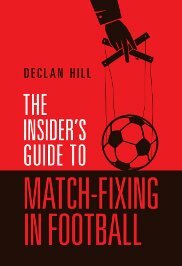 Pingback: Insider's Paradise: Corruption Looms Large Ahead of FIFA Presidential Election - Declan Hill - Institut für Fankultur e.V.